Last Friday evening a reception in honor of all Armenian workers at the United Nations took place at St. Illuminator’s Cathedral in New York City. The reception was hosted by the Armenian Mission to the United Nations and St. Illuminator’s Cathedral. The attendees at a reception last Friday at the Cathedral’s Pashalian Hall in honor of all Armenian workers at the United Nations. H. G. Bishop Anoushavan Tanielian, Vicar of the Prelacy, flanked by H.E. Garen Nazarian, Armenia’s Ambassador to the United Nations, and Rev. Fr. Mesrob Lakissian, pastor of St. Illuminator’s Cathedral. 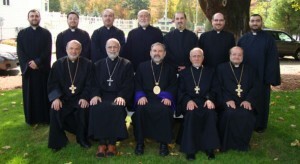 Archbishop Oshagan, Bishop Anoushavan, and Rev. Fr. 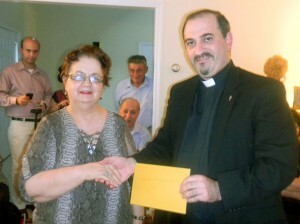 Mesrob Lakissian, pastor of the Cathedral, with the senior citizens group during the Christmas party. Archbishop Oshagan and Bishop Anoushavan joined with the senior citizens group of St. Illuminator’s Cathedral to celebrate Christmas on Tuesday, December 20. The Prelate and Vicar enjoyed spending the afternoon with the seniors and wished them good health and happiness. Last Sunday St. Illuminator’s Cathedral in New York City was filled with parishioners and friends to witness the ordination of Krikor Esayan to the Diaconate. 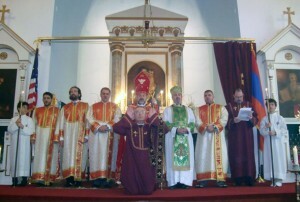 Bishop Anoushavan Tanielian was the celebrant of the Divine Liturgy and ordination service. Assisting His Grace at the altar was Rev. Fr. Mesrob Lakissian, pastor of the Cathedral. A Requiem Service on the occasion of the 8th anniversary of the passing of His Eminence Archbishop Mesrob Ashjian took place following the Liturgy, in remembrance of the Prelacy’s former Prelate, who served from 1978 to 1998. At the conclusion of the liturgy, ordination, and requiem services, the faithful were invited to gather in Pashalian Hall where a beautiful buffet luncheon prepared by St. Illuminator’s family of parishioners, was served in memory of Archbishop Mesrob, and in honor of the newly-ordained deacon, Krikor Esayan. St. Illuminator’s Cathedral in New York City conducted a special Sunday School dedication service last Sunday for all Sunday School teachers and students. The service, led by the Cathedral’s priest Rev. Fr. Mesrob Lakissian, and Deacon Shant Kazanjian, took place immediately after the Divine Liturgy. Deacon Kazanjian, who is the Director of the Prelacy’s Armenian Religious Education Council, spoke about the importance of Christian education and praised the efforts of the teachers and parents. A retreat for the clergy took place from Sunday evening through Wednesday, October 9 to 12, at the Holy Virgin Mary Spiritual Vineyard in Charlton, Massachusetts. On the occasion of the Feast of the Holy Translators, the members of the New Jersey Armenian Cultural School Association (ACSA) hosted an event at the home of Dr. & Mrs. Setrak and Ofig Jidarian. Rev. Fr. Mesrob Lakissian, pastor of St. Illuminator’s Cathedral and Yn. Ojeen Lakissian attended the event. 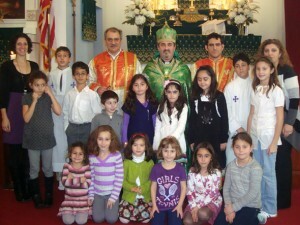 The ACSA donated $15,000 to St. Illuminator Armenian Day School during the event. Der Mesrob accepted the generous gift and thanked the members and guests on behalf of St. Illuminator Day School.